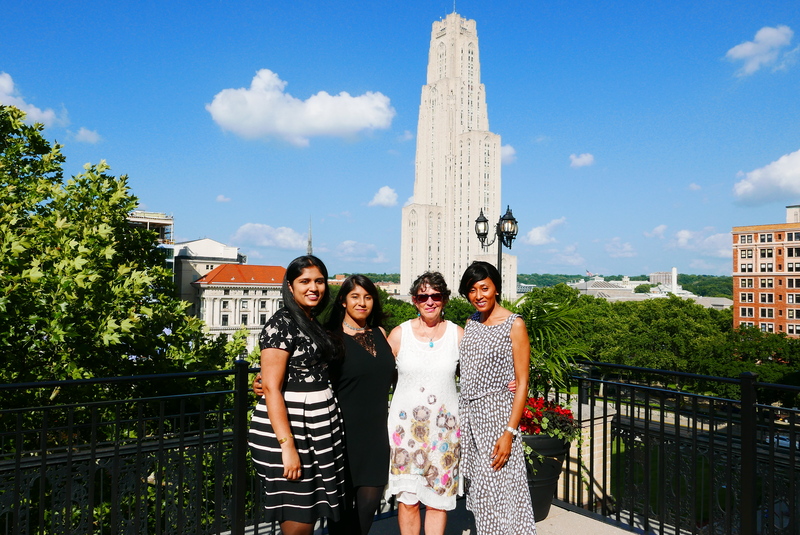 Rising junior engineering students Sneha Jeevan and Shivani Tuli came to Pitt with entrepreneurship on their minds. Following their participation in the Randall Family Big Idea Competition last February and March, they were eager to continue to develop their idea for a medication dispensing bottle and app that would make it easier for patients to take the right medications at the right time. “I come from an entrepreneurial family, and was pleased to see that Pitt offers so many resources for students who want to be entrepreneurs,” Tuli said. The two friends hope to soon form a company, Heardio, around their idea. They were among 10 teams selected from the Big Idea competition to enter the Blast Furnace student accelerator in May and June. 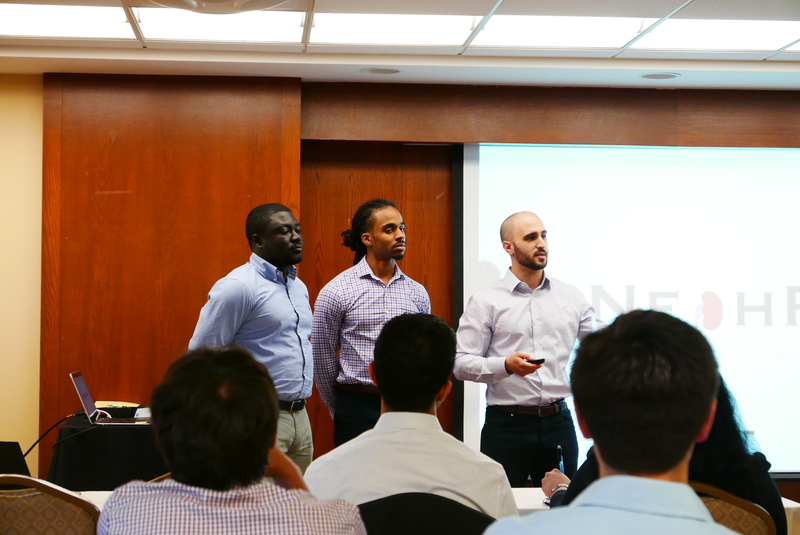 The cohort recently concluded with a presentation day where the teams pitched their fledgling companies to a group of prominent VIPs from the regional startup ecosystem. For Katz Graduate School of Business students Will Chastka, Jon Powers and Mike Nackoul, Blast Furnace provided the opportunity to further test the customer value proposition for their startup, Adventure Hound, which aims to connect outdoor enthusiasts with owners of private land. Babs Carryer, director of the Big Idea Center for student entrepreneurship at the Innovation Institute, said the quality of ideas coming out of Pitt is reflected in the profile of the guests from the local innovation and entrepreneurship ecosystem that attended the presentation day. Attendees included Rich Lunak, CEO of Innovation Works, Zach Malone of Draper Triangle Ventures, Nancy Santori of BlueTree Allied Angels, Rasu Shrestha, Chief Innovation Officer of UPMC Enterprises, Drew Morris of LifeX, Mike Matesic of Idea Foundry, Laurie Kuzneski of Kuzneski Insurance Group, Larry Miller from Innovation Works, Sephan Mueller of Ascender, Prashant Ambe and Ganesh Mani of TiE Pittsburgh, Jason Jones of Woodford National Bank, Aaron Watson of Going Deep with Aaron Watson, and Alicia Varughese of Pittsburgh Life Science Greenhouse. 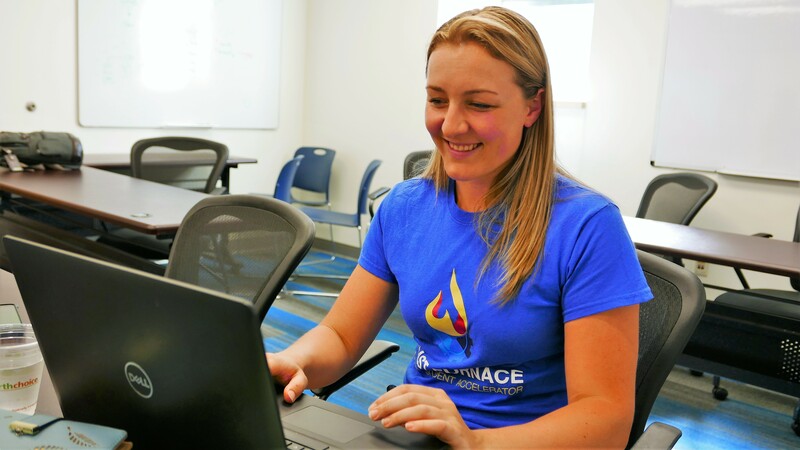 “I never cease to be amazed by the inventiveness and passion of Pitt student entrepreneurs,” said Kuzneski, who with her husband, Andy, sponsors the Kuzneski Innovation Cup, one of two student pitch competitions held each October prior to the Pitt Innovation Showcase. For Mike Washington, a postdoc in the lab of Morgan Fedorchak, assistant professor of ophthalmology, bioengineering and clinical & translational sciences, Blast Furnace helped to validate potential market for an ocular gel bandage technology developed in the lab. Together with his business partner Valerie Quickel, who just graduated from the Pitt College of Business Administration, they are exploring the Small Business Innovation Research (SBIR) grant program to fund continued development focusing initially on the military market. “We learned so much, not only from our work on our project, but also from the experiences of the other teams in Blast Furnace. That’s what makes it so worthwhile,” Washington said. Shrestha, from UPMC, said he is encouraged by the ever-increasing quality of the startup teams coming from Pitt. 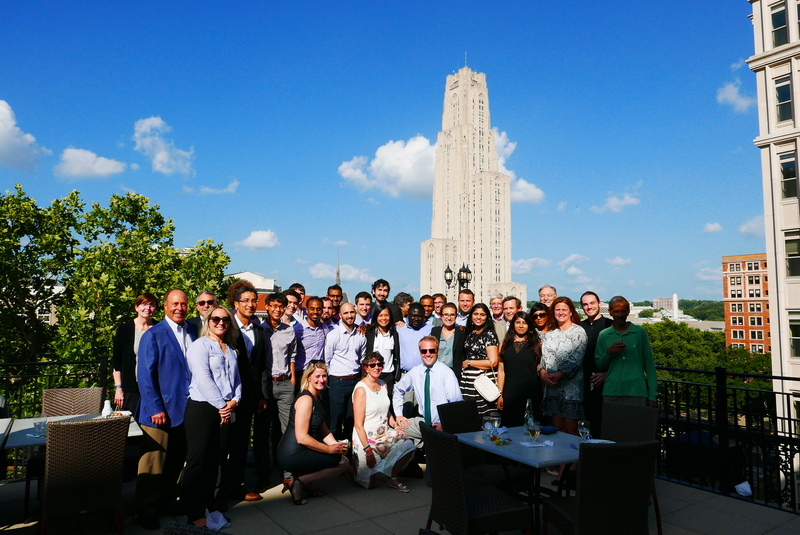 “Pitt has come a long way in the past several years in the education and resources that it provides to students around innovation and entrepreneurship. There are a few that we are considering doing an investment,” he said. Special guests at the presentation day were Pitt trustee Bob Randall and his wife Rita, and their son Brett Randall with his wife Jana. The Randall Family earlier this year donated $2 million as a seed gift to establish the Big Idea Center for student entrepreneurship. The Randall Family has previously sponsored the Big Idea Competition over the past 10 years, donating $100,000 per year in prize money. The Big Idea Center coalesces a wide range of educational programs, competitions and resources for students across the University and a every level who are interested in gaining hands-on experience in taking an idea from concept to a reality. Waseem Lutfi outlines the struggles that many med students face when learning the physiology of the renal system and how their solution, NephRun, an online education app, can eliminate the challenges of learning one of the most complex organ systems in the body. Gideon Nkrumah, left, & Stephen Canton., right, Pitt med students are also a part of NephRun. 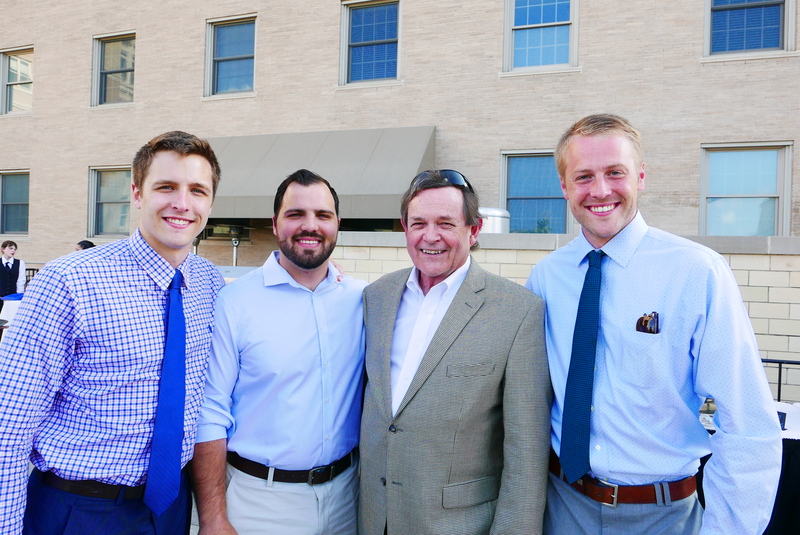 Members of team AdventureHound, from left, Will Chastka, Mike Nackoul and Jon Powers, with entrepreneur in residence Don Morrison. Ph.D. 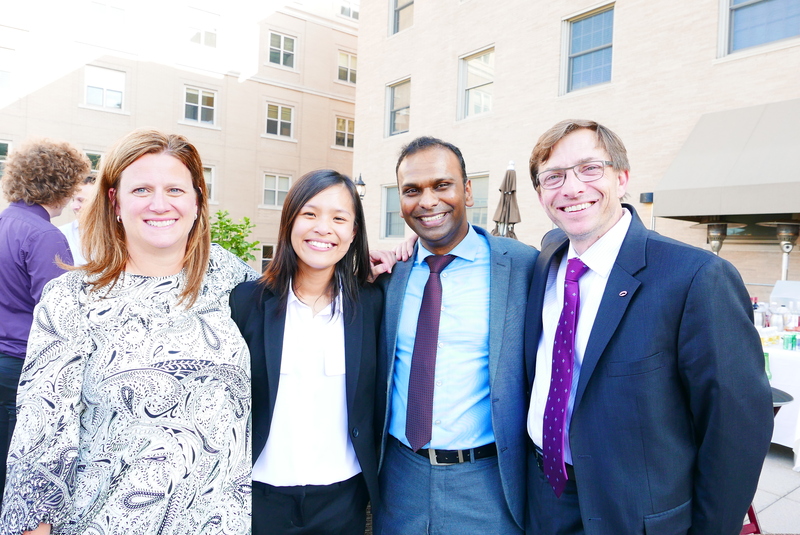 Candidates of Rehab Science, SHRS, and members of WheelFit, Deepan Kamaraj and Kalai Tsang, celebrate with mentors Joanna Sutton and Phil Marzolf, both Entrepreneurs in Residence at the Innovation Institute. 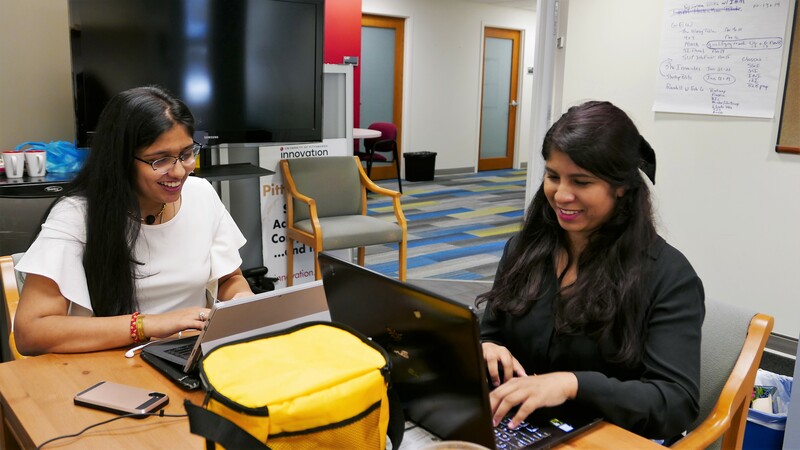 Shivani Tuli, left, and Sneha Jeevan of team Heardio and rising Bioengineering juniors, put the final touches on their presentation. 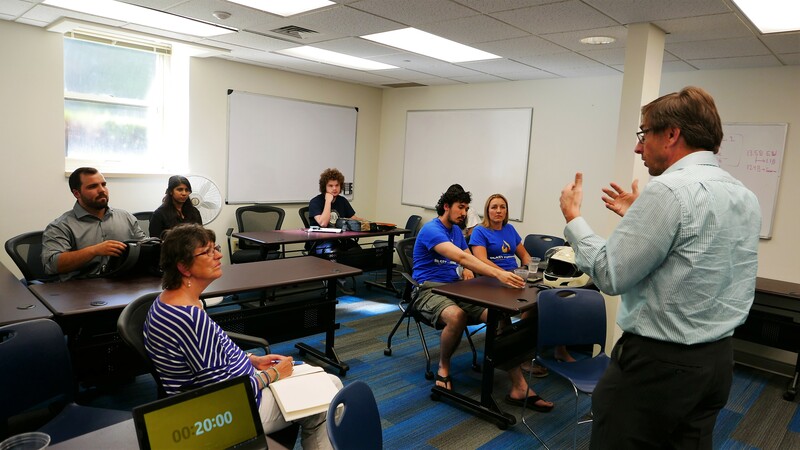 Entrepreneur in Residence Phil Marzolf shares his experience with Blast Furnace students inside the Big Idea Center for student entrepreneurship. Phil Marzolf. Yolandi van der Merwe, Ph.D., Bioengineering & Biomedical Engineering prepares her pitch for Re-Vision, a novel therapy using biomolecules to help preserve vision after injury. Babs Carryer, center with sunglasses, director of the Big Idea Center for student entrepreneurship, celebrates with Blast Furnace students on presentation day.